Barely one week after the momentous signing of an MoU between IITA and the University of Florida (UF) in USA, IITA scientists have started exploring ways to build a productive research engagement and partnership between both institutions. By invitation from UF Pre-eminent Professors Pedro Sanchez and Cheryl Palm, and facilitation by the Director of Central Africa Hub, Bernard Vanlauwe, a team of four scientists—Julius Adewopo, Fred Kanampiu, Generose Nziguheba, and Dries Roobroeck—attended the annual international conference of agronomy, soil science, and crop science which was held in Tampa, Florida. The team also visited the University’s main campus in Gainesville, to initiate discussions on short- and long-term collaborative opportunities with UF faculty members whose expertise and research interests align with the priorities and needs at IITA. 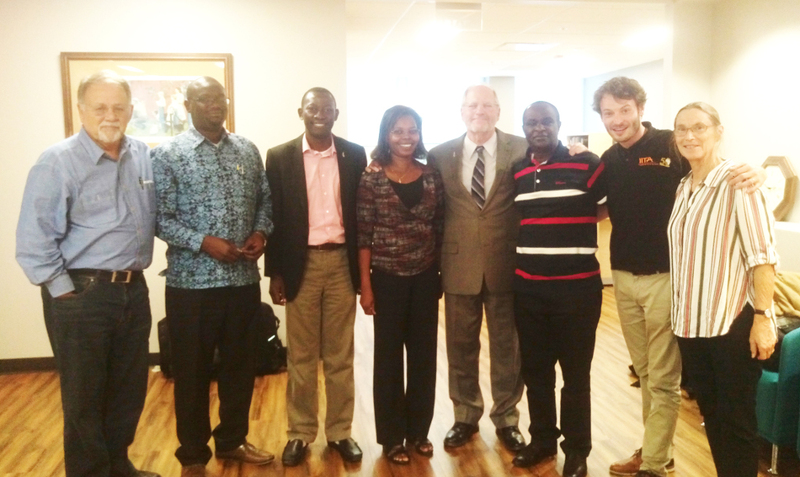 IITA staff visiting UF colleagues in Gainesville, Florida to discuss collaboration. During the two-day visit on 26-27 October, the team had discussions with faculty members from UF’s Institute for Sustainable Food Systems, the Soil and Water Science Department, and Agronomy Department, to identify areas of mutual interest and commence plans for the exchange of expertise and co-development of innovative solutions for agricultural development. Common interests emerged around: (i) Application of advanced tools for assessing knowledge, practices, and impacts at varying levels, (ii) use of modern algorithms and tools to map crop yields and related constraints (both biotic and abiotic), in space and time, and (iii) improvement of capacity for predictive agronomy in IITA. Immediate areas for building synergy include exchange of fully funded UF students who will be hosted by IITA researchers to undergo International Agroecological Studies within the scope of ongoing research at IITA, and IITA-UF scientist exchange programs. Further, with the implementation of IITA’s institutional Open Access policy, UF researchers will work with IITA scientists to integrate datasets within and across projects. As this partnership evolves, new funding opportunities and joint projects, will be explored to tackle an array of system-level agricultural production issues. Priorities will be guided by the challenges facing smallholder farmers, such as low yields of staple crops, emerging pests, weeds and disease threats, non-responsiveness of soils to nutrient amendments, and overall targeting of technologies and tools for sustainable intensification relative to current and future biotic and abiotic changes. 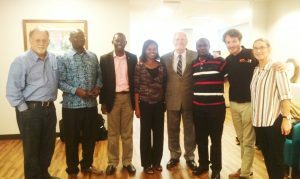 The IITA visit was concluded with a meeting with the UF Senior Vice President for Agriculture and Extension, Jack Payne, who led the signing of the IITA-UF MoU from the UF side. He reiterated the University’s unwavering commitment to strengthen its leadership in global agricultural production and food sustainability. He highlighted the relevance of the IITA-UF partnership, and the University Management’s vision to broaden its international impact under the auspices of this budding relationship. Further, Payne emphasized the undeniable position occupied by Africa as the cornerstone of global food security post-2025. He concluded by pledging support to nurture the relationship.